Last year, Sofitel Ambassador Seoul held a special event "Looking for 1st 70-80 wedding generations" from May to December to celebrate its 50th anniversary. At the event, participating couples unloaded their old wedding photos to apply for several complimentary benefits from the hotel such as a free accommodation and breakfast on their wedding anniversary and lucky chance to win several door prizes. The event draws a considerable amount of interests among those who had their weddings at the hotel in 1970s and 1980s. The eight-month long event "7080 Wedding Festival" ended last December with a total 230 couples of participants mostly in their late 40s or 50's now. 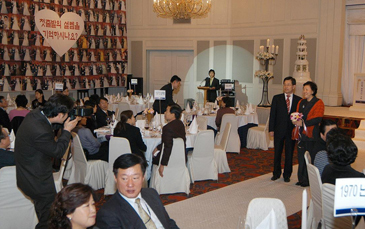 On January 20 2006, the hotel held a special gala dinner party for all participants in the special 50th anniversary event. The special gala dinner was held under the mood of "wedding banquet" at the Grand Ball Room with a wedding hall-like set to bring back sweet memories of 7080 weds. The aisle was beautifully decorated with flowers, where the invited couples enjoyed their memories back in 70's and 80's, taking commemorative photos. Especially, the wall of the banquet hall was covered by two huge banners full of wedding photos of couples provided during the event. Couples at the party seemed to be back to their weddings. Tables at the party were divided by 70's and 80's and couples on the same table shared their sweet memories by exchanging their names and enjoying dinner and wine altogether. Followed by brief video presentation introducing the 50 years of history of Sofitel Ambassador Seoul, the main gala dinner party got kicked off with a welcome address by general manager, Mr. Douglas Barber. The representative of guests showed their appreciation for the special treatment provided by the hotel and made a quick suggestion that they'll have a regular gathering at the hotel as a community. The last part of the dinner was a lucky draw with various gifts including free banquet vouchers, free accommodation vouchers, Kimchi refrigerator, merchandise certificates and so on. Also, all the guests will get a 10 percent discount when their children have their wedding at Sofitel Ambassador Seoul. The joyful dinner party was a perfect example of hotel's effort to "share memories with guests" as guests and the hotel were together as one. The hotel believes that this kind of guest event will work effectively as it deepens the relationship between the hotel and guests and shares memories with guests, who are the part of the history of the hotel. The special event "7080 Wedding Festival" was indeed one good example of "Emotional Marketing" to draw loyalty from guests by providing emotional need of guests.